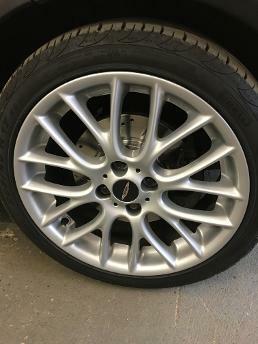 Based in the South East of England, Stealth Alloys offers the full service when it comes to alloy wheel refurbishment. Your wheels will only be worked on by our trained technicians so be rest assured your investments are in safe hands. Furthermore all technicians are also qualified to an Advanced Level 3 standard in Motor Vehicle Mechanics, in turn allowing a flawless knowledge of the whole process from removing and re fitting wheels to your vehicle after the refurbishment process has been completed. Here at Stealth Alloys all our refurbishment work is carried out on site in our fully equipped state of the art workshop and we offer multiple options on putting your wheels back to prime condition. Due to Stealth Alloys possessing some of the most up to date and modern machinery available, we are sometimes able to offer a same day turn around of the refurbishment of your alloys, depending on the severity of thedamage. Simply drop your car into us in the morning and pick up at the end of the day with pristine alloys. or in certain circumstances where you are unable to get to our workshop we also offer a collection and delivery service of your alloys. Click Here For A Free Quote!! Here at Stealth Alloys we not only refurb your wheels back to prime condition but we will also check for any damage to the wheels prior to being refurbished. For example we extensively check the wheels prior to refurbishment for any signs of cracks in the wheels. We also offer free tyre depth checks and are allrecorded on an information sheet that will be left with yourself after the process is complete.